Social media at work – Is it ethical to log in when you’re on the clock? This week’s lecture boils down to one thing: If you wouldn’t say it in person or on air, don’t post it on social media. It doesn’t matter if you’re a well-known celebrity or a relatively unknown graduate student, the rule applies to all! The nature of social media (especially Twitter) is that anything you say can go viral in minutes. Even if you have post-posting regrets and delete a controversial comment, there’s a good chance that others have already seen, documented, or shared your content. Social media has changed the dimensions in which people can connect with news personalities, public figures, and celebrities. Long gone are the days of only seeing them when they’re in a controlled setting (work, press circuits, etc.). Social media gives us access to what public figures are doing and thinking 24/7. While this unlimited access is great for the fans, it does add a little bit more pressure to the public figures. For instance, if a broadcaster feels passionate about a specific issue, they may have to stifle their opinions in order to remain unbiased for the viewers. Journalists also may have access to information that hasn’t been made public yet. They shouldn’t take to social media to spout off about confidential information until they have been given the green light from an editor or producer. Broadcasters and journalists always have to be aware that they’re representing an organization/brand whether they’re on the clock or off. As a news editor or producer, you have to be vigilant about what your reporters are saying online. At a previous newspaper that I worked at, we had an older staff, many of which hadn’t yet embraced Twitter. These factors made it pretty easy to stay on top of what our reporters were saying on social media, on and off the clock. As news continues to evolve and Twitter plays a larger role, they’ll have to put formal social media guidelines in place. These guidelines will have to explain that the reporter is in the public eye and represents the brand, and they don’t have the luxury or saying whatever they want online. After the Boston Marathon bombings, many Americans took to social media to follow coverage of the attacks, and also to show support for the victims, their family and friends, and the city of Boston. In fact, just minutes after the bombings, “#PrayForBoston” was trending on Twitter. In the spirit of trying to get news out there and trying to show support for the city of Boston, many graphic photographs from the scene were shared on April 15 and the days following. Although those sharing the photos may have had good intentions, there are ethical implications to consider when sharing graphic images. 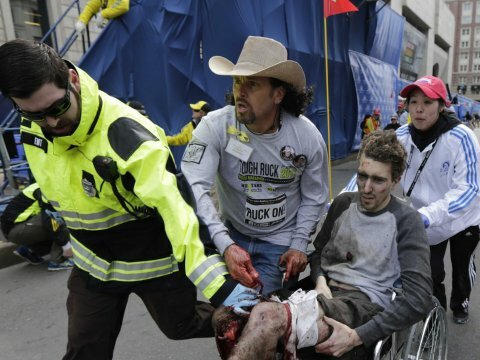 One of the images that went viral after the bombings showed a victim who lost his leg in the blast. The man has since been identified as Jeff Bauman. The photograph clearly shows Bauman’s face, so his family and friends could see it in their newsfeeds before they got any notification from Bauman himself. I couldn’t imagine finding out about my loved one in this manner. Not only does the victim need to be taken into consideration, you also need to think about minors online and whether or not graphic images are appropriate for them to be viewing. Some may argue that if they’re online without parental supervision, they’re old enough to handle whatever content they see. Here’s my problem with that logic: Minors are going to find ways to get online without their parents knowledge, and I’m 25 and photos from Boston are hard for me to look at. You could also make the argument that your social media followers are all adults. However, with the viral nature of social media (especially Twitter), the content you share could be seen by the world in mere minutes. If you wouldn’t want your child to see the image, I wouldn’t recommend sharing it on social media. As much as we can all weigh in on how sharing graphic images is or isn’t ethical, I think the best point of view that we can receive is from the victim himself. One year after the attacks, Bauman was interviewed about his iconic photo. He said he wished that his parents hadn’t found out about his injuries from the photo, or seen him in that state. His mother searched for him for hours after the photo had gone viral. Bauman also said he wishes he wasn’t the face of the victims so he could recover in peace and at his own pace. I’ve mainly been talking about the unethical nature of posting graphic photos, but Bauman points out another side to the issue. He said he’s no longer angry about the photo because the photographer was doing his job and was helping in his own way. He was showing the world the truth. He also points out that the photo isn’t about of the bombings or him being injured. The photo captures the heroes who helped save people that day. News organizations are going to share graphic images, that’s the nature of news. Next time before you share an image, consider the people you could be impacting. I was at work when bombs exploded in the streets of Boston during the city’s infamous marathon. As a runner myself, I had so many questions, but without access to a TV, I turned to Twitter for answers and updates. I wasn’t the only American who logged into a social media account for coverage on the Boston Marathon bombings. According to the Pew Research Center, a quarter of Americans received their information about the bombings from social media. Social media is a great tool for news seekers, but it also has rapidly increased the flow of information, which can lead to more inaccuracies by news agencies online. Even CNN tweeted inaccurate information after the attacks on Boston. It’s no surprise that rapidly evolving situations can also lead to ethical concerns. It was the Boston Marathon bombings that forced me to reevaluate the content that I share on social media. After the attacks, I retweeted a photo of a victim that included a heart-wrenching story. I later discovered that this information was completely made up. As sad as it is, there are people who try to capitalize on tragedies. If you’re going to share information that you find on social media, it’s best to make sure that it comes from a reliable source. Even reliable sources get it wrong sometimes, so do your own investigating before you share any content on social media. Several broadcasters and companies were blamed for trying to capitalize on the Boston tragedy. One broadcaster posted a photo of one of the victims in his hospital bed on Facebook. He then asked his followers to “like” the photo to wish the boy a speedy recovery. Because I don’t know the broadcaster or his relationship to the victim, I can’t accurately speculate on his motive for posting the photo. If the post was his way of getting page likes, it’s obviously unethical. However, his post could have been to raise the boys spirits and to raise awareness (money) to help the victim. Only he knows his true intentions. Many people scolded the company for using a tragedy to promote products. Once again, without being the one making decisions for Ford, I can’t really speculate on their intent. I think it would have been in better taste if the company had dropped the Ford logo in the corner and used an image of real first responders on the scene in Boston. This approach would have made it seem less like an advertisement, and more like a genuine thank you. I check my Facebook account about a million times a day, so it’s not surprising to me that 72 percent of social media users that the National Business Ethics Survey polled, say they log into their social networks while they’re at work. Twenty-eight percent of the 72 percent said they spend an hour or more on social networks while they’re on the clock. One third of those people admitted that their social activity isn’t work related. Clearly, employers have their hands full with social media. Several of the places that I have worked have handled the distraction of social media by blocking the sites on company computers. That was a pretty effective tactic until the invention of smart phones. They proceeded to tell employees they weren’t allowed to be on their personal phones, but I’ll admit that on lunch breaks or when there was a lull in the action I used my iPhone to check out what was happening on my Facebook or Instagram pages. Luckily now that I’m working in social media, I don’t have to try and hide my social media use! It was pretty well known at one of my previous jobs that the employers were checking employees’ browser histories to see what websites they were spending time on. Is that invasive? Yes. Is it unethical? No. They’re paying you to do a job for them and I’m guessing your job description doesn’t include scrolling through the Facebook album of your friend’s baby shower! Not only are they paying you to get work done, the computer you work on belongs to them. They have the right to make sure that you’re using their property for the right reasons. If you’re a manager or business owner, it’s important to have some type of social media policy in place. Be transparent with your employees and let them know what is and isn’t acceptable. Your policy should address social media use on and off the clock. You want your business to be well represented beyond the hours of nine and five. It’s expected that employees will have a life outside of the job, but remind them to think before they post on social media accounts because they represent the company. Instead of viewing social media as a distraction, use it to your advantage. Set up a social media page regarding your social media policy. When employees have a question, they’ll know where to look. They’re much more likely to read it on the social sites where they’re already spending time, as opposed to a bulky packet (don’t kid yourself, they won’t read it!). While it’s important to set clear guidelines, don’t make rules so strict that employees are afraid to spend time on social networks. Employees are great brand advocates. Think about how far your content could reach if your employees were sharing it with their network of friends. Encourage employees to follow and engage with the brand on social sites, and really use social media as an asset. 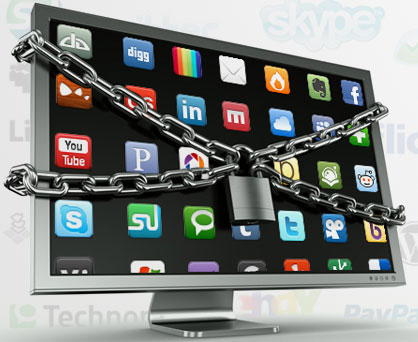 This week continues the debate on social media and privacy. It’s surprising to me that 13 million people are completely unaware of their Facebook privacy settings. If you’re going to maintain social media profiles, it’s important that you’re aware of who can see the information that you’re posting. I try to check in with my Facebook privacy settings somewhat regularly because the network is constantly evolving. In fact, I just adjusted my privacy settings on the network today. Even though I’m well aware of the privacy settings of the social networks that I maintain, it seems as though I may be in the minority. We were asked what the social networks could do to help more users to understand their own level of control over their information, but I wonder if that’s even their job. It’s our information and reputations, shouldn’t we be the ones seeking out our privacy settings? Sure it would be helpful for the networks to inform users how they can manage their privacy settings, but I don’t think that they’re doing anything ethically wrong by not going out of their way to insure that every user is aware of how much of their information is being seen by the world. They could highlight it in the terms and conditions when users are signing up for an account, but honestly, how many users are actually reading through the agreements that they sign? The power lies in the hands of the users. Professor Norm Lewis raises some interesting questions about whether or not it’s ethical to approach potential interviewees on social media without identifying your intentions. Having served as an editor for a daily newspaper, I can see both sides of this issue. I know the pressures that exist in the newsroom when everyone is trying to break the next big story, but I can appreciate interviewees wishing to have privacy on their social media networks. Social media definitely blurs the lines a bit of what is acceptable when approaching a potential interviewee. Is approaching a potential interviewee on Facebook or Twitter evasive? Yes. Is it unethical to approach them via social media or republish content from their social pages? No. It’s the social media user’s responsibility to understand their privacy settings. If they don’t want the world to see what they’re posting, they have the capability to limit who can see their post…better yet, they can choose not to post about certain events at all! If an event is truly private, I’m not going to blast about it on social media. As a journalist, I’ve used social media to contact and research potential story leads or subject matters. If they have a provocative and useful quote on their page, that’s fair game. That being said, I also try to respect peoples’ privacy on social sites. If they have their page set to private, I’ll send them a message explaining who I am, and what my intentions are. It’s all about finding the right balance. Because of events like the National Security Administration being called into question for spying on American citizens, data mining has been at the forefront of the news in the past couple years. Just in case you haven’t figured out what data mining means in this digital age, it’s when corporations collect and huge amounts of data to predict patterns. Not surprisingly, this collection of data has raised many concerns. As a marketer, I can see the advantages of data mining. The collection of consumer data can result in a better understanding of who your customers are and what they want. Any marketer that tells you they wouldn’t like to have more information about their consumers is either lying to you or not a very good marketer! Even as a consumer, I can see how data mining could be beneficial. Of course I want my shopping experiences and products to be tailored to me. I’m not likely even to notice a product or story if it’s unrelated to any of my interests. The positives of data mining aside, I share many of the same concerns as my fellow consumers. Any data about me that is collected without my consent seems to violate my privacy. It’s one thing if I voluntarily take a survey or fill out a questionnaire about an organization…then I at least have some control over what information is being collected and who is receiving that information. It’s a whole different story if someone is collecting information about me unknowingly, and sharing what could be private information with others before I share it with them. For an example, check out this article about how Target knew a teen girl was pregnant before her father did. As a marketing manager, I would be very transparent with consumers if and when I was data mining. I would be very upfront about the fact that we were collecting data in order to make a more tailored customer experience. I would let them know that their information would be secure and anonymous. Finally, I would allow consumers an opt-out option if they wished not to be tracked. Hopefully these steps would ensure that my customers felt secure when they were visiting my site. Obviously organizations spying on citizens or tapping into their cell phones is a little more intense than any data collecting I would be doing. I’m sure some people will say that various organizations may be collecting this information for the public safety, and I’m really grateful for any information collected that has prevented the loss of life. That being said, I don’t think that ordinary people should be subjected to this clear violation of privacy. Whether you’re conducting business in an office, or you’re conducting business online, accuracy is essential to success. As a former newspaper editor, I know that you’re only as good as your word. From the standpoint of a consumer, I wouldn’t want to share the content or follow an organization that wasn’t posting accurate information on social media. I certainly wouldn’t want to make purchases from an organization that I didn’t trust. Social media (especially Twitter) has sped up the rate at which people consume news and information, and that makes fact checking critical. News outlets are always trying to be the first to break a big story, but that doesn’t mean that accuracy can go out the window. Although it didn’t happen on social media, one news organization that was so focused on breaking a story and didn’t do enough fact checking, was KTVU News after the Asiana plane crash. As funny as this mistake was, KTVU lost a lot of credibility after the incident. As much credit as a news organization might gain from breaking a story, all credibility is lost if that story is inaccurate. The audience expects news organizations to be accurate. It wouldn’t have taken much work or time for KTVU to fact check the information that they received, and if they had, they might not be the laughing stock of the entire world. If any type of organization posts information on social media that turns out to be false, I don’t think it’s unethical for them to delete that post. Although organizations should aim to be transparent and should acknowledge their mistakes, if they leave the inaccurate information on their social media pages, people who are unaware of the situation may share and spread that false information. By deleting the inaccurate post, acknowledging their mistakes, and providing followers with accurate information, an organization can get back into the good graces of their consumers. Deleting a false post can actually show an organization’s followers that they care about the accuracy of the information that they’re spreading. If I were the social media manager for KTVU and I had posted the inaccurate information on our social media pages, I think it would be unethical not to delete the post. As humorous as the mistake was, people died in the crash. Leaving the post up would be in bad taste for the families that lost a loved one in the crash because to them it’s not a joke.